Surveys were conducted in waters off O’ahu, Ni’ihau, and Kauai, as well as in deep-water and offshore in the area to the north of Kaua’i. The latter deep-water portion of the survey was called the “Na Pali-Ni’ihau” survey. The track line of the entire survey is shown in Figure 1. 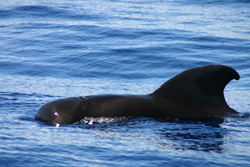 A summary of our results and findings (as well as the TOC, and a list of tables and figures) can be read from the executive summary of the Cruise Report for our 2005 survey, the report entitled “A Preliminary Acoustic-Visual Survey of Cetaceans in Deep Waters around Ni’ihau, Kaua’i, and portions of O’ahu, Hawai’i from aboard the R/V Dariabar, February 2005.” The full report is available; if you would like a copy, please email us. Over 745 km of survey effort was conducted, including a total of 586 km of visual observations (over half “on effort”) resulting in 78 groups of 179 individual cetacean sightings. In addition, over 200 acoustic detections of cetacean vocalizations were acquired from humpback whales, minke whales and unidentified dolphins. During the Na Pali-Ni’ihau survey, we obtained recordings of vocalizations from deep diving odontocetes such as sperm whales and pilot whales. We were also able to monitor calls and songs from baleen whales including not only the common humpback whale (which sings long and complex songs), but also the rarely seen (in coastal Hawaiian waters) minke whale, which has a unique call known as the “boing” call. These boing calls were only recently attributed to this cryptic species in work done by a NMFS scientist who was working with us on the Dariabar (Shannon Rankin; available in Rankin and Barlow 2005). Sounds produced by minke whales are known to peak during February in this area of Hawaii, so investigating these calls was one of the things we were interested in doing for our work. We were very fortunate to not only acoustically detect numerous minke whales, but also to sight one during a one-day excursion into deeper waters near Ni’ihau. 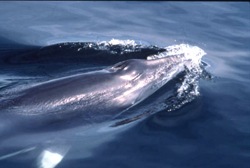 This is the first documentation of a minke whale in coastal Hawaiian waters. These findings were presented by Tom Norris at the December 2005 Society of Marine Mammalogy Biennial Conference in San Diego, both as a poster presentation and a spoken presentation. 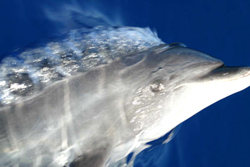 The Cetos Poster 2006 known as Hear Me, See Me: An Acoustic and Visual Survey of Deep-water Cetaceans. You can also read a daily account of life on the Dariabar while we were in Hawaii, written by our Cetos scientist Mari Smultea, by reading “2005 Dariabar Journal“. Finally, for more on our photo ID findings from 2005 from both this project and the humpback whale social sound project, see our “Photo-ID results” page.